10 Home Remedies for Constipation That Give Fast Relief! 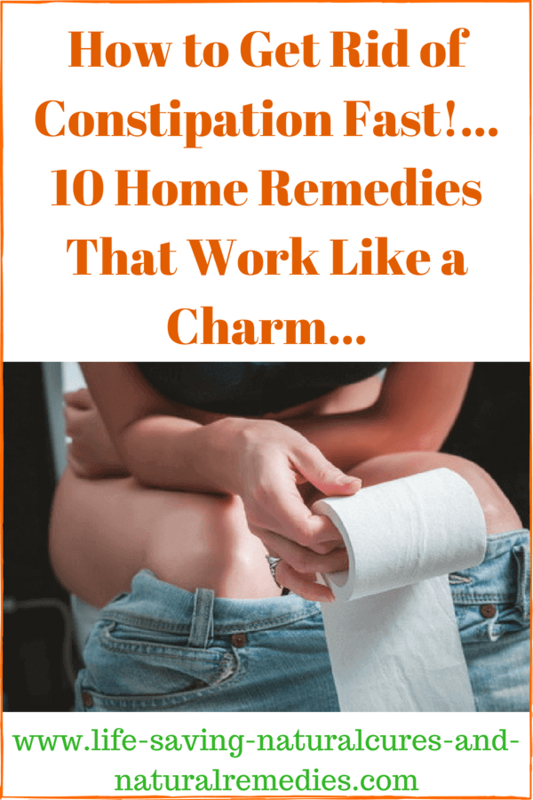 Here's a natural remedy for constipation that's guaranteed to work fast (for both adults and kids), along with other highly effective home treatments that get rid of severe constipation problems quickly, effectively, and permanently! So what’s the minimum requirement for staying healthy and “regular” in the number two department? Well, at least one normal bowel movement a day is the minimum according to health experts, but two or three is the optimum amount. I don’t know about you, but I certainly couldn’t poop 2-3 times a day. Once a day is definitely enough for me! The truth is there is no set amount or minimum daily or weekly requirement for healthy bowel movements. Some people have three a day while others may only have three a week. However, if you’re feeling bloated and uncomfortable and feel like you want to go but nothing moves, then it’s highly likely you’re constipated. Or if you do manage to go but it feels like you’ve just pushed out the Rock of Gibraltar, then you're also suffering from constipation and definitely need some remedies and natural ways to soften up your stools. So the “technical” definition of constipation is basically a bowel movement that’s delayed (by days or weeks) and is usually accompanied by a hard/compressed stool that becomes difficult and even painful to pass. If you’re constipated, it means your colon is not working properly. And a poor functioning waste disposal system makes a perfect breeding ground for unhealthy bacteria and parasites to grow and thrive. Being constipated also allows dirty, toxic liquids to be recirculated back into the body. The tissues and organs then become the “dumping ground” for the toxic material that should have been eliminated. Your overall health and vitality can only suffer under these conditions. “Consider what happens to the health of a city when the waste disposal or sewage systems are inefficient. The potential for disease increases dramatically. 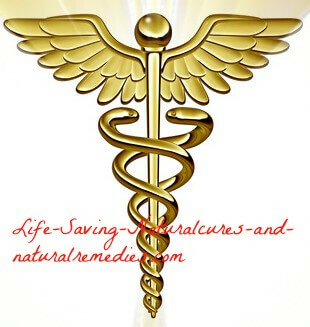 Disease potential is equally high when the colon does not function healthily”. This is why it’s absolutely crucial that you not only fix your constipation problem right now, but you also take the extra steps needed to cure it for good. Fortunately, the home remedies we're about to list will show you how to do exactly this. What are the Main Causes of Constipation? Poor diet is definitely the #1 cause of constipation. When you eat too many unhealthy foods such as refined and processed foods (this of course includes fried foods and junk foods), along with excessive amounts of red meat, your digestive system cannot function properly. This horrible gunk is very difficult for the digestive system to assimilate and even harder (literally) for the colon to eradicate. A lack of water intake and a lack of fiber in the diet are also two major causes of constipation, as is holding on and holding back a bowel movement because the timing may not be right. Water and fiber both help to remove waste and promote regular bowel movements, along with softening up stools (nice!). Holding back a bowel movement, however, dries out and compacts what should be coming out and literally makes it as hard as a rock (not nice). The American Gastroenterological Association estimates that people in the U.S. spend around three quarters of a billion dollars each year on laxatives.1 These are certainly the most popular treatment for constipation world-wide, but a potentially harmful one at that. The problem with pharmaceutical laxatives is they promote laziness in the bowel. Your body can easily become dependent on these “stimulants” to produce bowel movements and this eventually leads to a decrease in bowel function. The side effect of this is your constipation (and digestion) will actually become much worse. The overuse and dependency of pharmaceutical laxatives can also result in inflammation and damage to the muscles and tissues of the large intestine. They can also interact negatively with certain medications so we strongly recommend you leave these terrible inventions alone. And they do nothing to fix the underlying cause of your constipation anyway! The natural treatments and home remedies we're about to list, though, do. To prevent and treat constipation effectively, you need remedies that will “help things along” in a non-harming and gentle way with without side effects. These top 10 home remedies for constipation do this very effectively. They're also safe for the whole family to use (ages 3 years and up). For babies and toddlers though, it’s advised that you always check with your health care professional first before administering any type of home treatment or remedy. Magnesium is definitely the best natural remedy for constipation you’ll find. In fact, this mineral is guaranteed to make you “as loose as a goose” almost immediately! According to magnesium expert, Dr Carolyn Dean, magnesium is crucial for correct muscle action and nerve conduction. 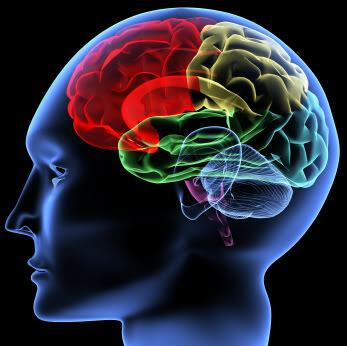 So it relaxes the nerves and muscles, which of course, includes the nerves and muscles of the intestines and colon. Magnesium also helps to draw water into the colon to soften stools, making them much easier to pass (take that you nasty Rock of Gibraltar!) So magnesium fulfils the two most important functions for treating and curing constipation; it relaxes the muscles of the bowel and intestines and helps to soften stools. If you’re prone to constipation, we recommend you don’t ever go without it! 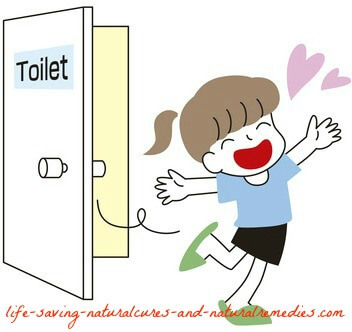 Firstly, you can take magnesium oxide, which seems to be the best for treating and curing constipation. For severe constipation you will need to take a high dose for the first 24-48 hours, somewhere around 3000-4000 mg’s (total amount for the day) in divided doses. This means if you have the 400 mg capsules, you would need to take 8-10 spaced evenly throughout the day. Then for your maintenance dose (so you never get constipated again) you take somewhere in the vicinity of 500-700 mg’s a day, preferably before bed. 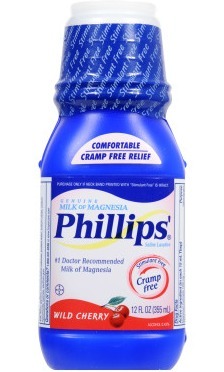 Milk of Magnesia (magnesium hydroxide) is also an effective treatment for constipation, especially during pregnancy. This is a fast-acting liquid version that’s actually the most recommended constipation cure by doctors. For dosages and advice simply follow the directions on the bottle. Then you have magnesium citrate, which also works extremely well for constipation. You can buy this in either a liquid or powdered form. Both are just as good as each other, not only for relieving constipation, but for keeping it away for good (as long as you stay with a regular daily dose). Around 600 mg’s a day is the maintenance dose, however, more may be required if you’re suffering from chronic constipation. Another magnesium product called Natural Calm is also excellent for treating constipation. And the great thing about this one is because it tastes so good, children love it! So if one of the littlies is having a bout of constipation right now, be sure to get some Natural Calm into them straight away. You’ll be pleasantly surprized by the results. As a final note, keep in mind that you will need to adjust your daily dose of magnesium once you get your constipation under control. So if what you’re taking starts to make you a little “too regular” then simply back off on the dosage a bit. Or if you find yourself getting “clogged” again, up the dosage a little. Just remember, magnesium is extremely important for overall good health and longevity so be sure to make it part of your daily health regimen no matter what. It’s not just for preventing and curing constipation you know! If you’ve ever read about (or done) the popular lemon detox diet, you’ll know the first thing you have to do in the morning is drink a liter of sea salt water. It’s then highly recommend that you stay very close to the thunder box for at least an hour afterward. Why? Because you're going to be pooping to your heart’s content that’s why! The beauty of salt is it draws water into the bowel to soften up stools and flush you out (and be ready because it literally does “flush you out”… bum wee style!) You can also use baking soda as well, which does the same thing. Use both together if you’re severely constipated or only one for mild constipation. So for this treatment, simply mix 2-3 teaspoons (½-1 teaspoon for kids) of either sea salt, pink rock salt and/or baking soda in a regular size cup of warm water or fruit juice. Also squeeze the juice of ½ a lemon into the drink as well for extra benefit and taste (lemon juice also helps to promote regular bowel movements). Chug it down on an empty stomach, then sit back and wait for the magic to happen! Also bear in mind that if you’re chronically constipated, you may need to repeat this remedy again in around 3-5 hours. And in addition, make sure you always drink plenty of clean, filtered water when using this home remedy as salt can cause excessive thirst and mild dehydration. Olive oil is a simple and easy home remedy for constipation. And because most people already have some sitting in their pantry, it can be used right away. Olive oil stimulates the digestive system and kicks it into gear, so things usually get moving in the waste department fairly rapidly. Just take a tablespoon (½ for kids) on an empty stomach, preferably first thing in the morning, then every 3-4 hours until you find yourself going free and easy. You can also add a teaspoon of lemon juice to this one as well for flavor and extra benefit. And if you find the taste of olive oil really unbearable (some people do), adding a pinch of sea salt to it definitely helps. Also remember to try and buy the organic extra virgin olive oil that you find in dark bottles if you possibly can. This is the safest and most effective of the oil (it doesn’t go rancid). Here’s another oil that will literally have you pooping through the eye of a needle in just a few short hours! Castor oil is definitely one of the most effective remedies for constipation. The problem though is sometimes it’s a little too effective. So if you’re going to try this one be sure to stay close to the toilet, and whatever you do, don’t use this remedy before bedtime or you may find yourself having a really nasty accident while you’re sleeping! So if you have chronic constipation and you’re desperate for some immediate relief, give this one a go. It will definitely do the trick. 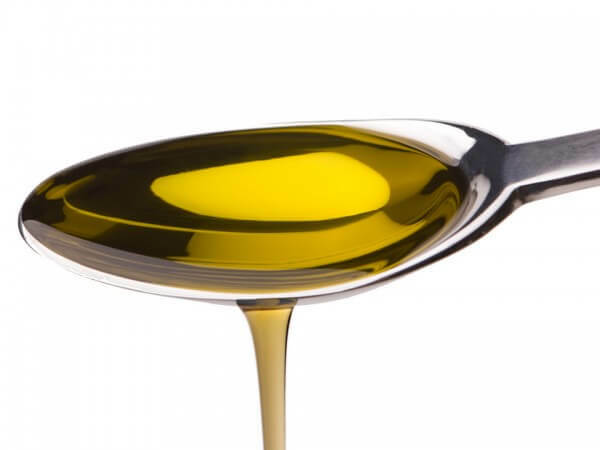 Simply take a dessert spoon of castor oil on an empty stomach. Because it doesn’t taste the best, you can have it with some orange juice or apple juice if you like to get it down. But make sure you only use this remedy if you’re going to be at home or close to a toilet. We can't stress this enough. (And you might want to make sure it’s a sound proof toilet as well!) Within a few hours you’ll find yourself enjoying some much needed and welcome relief. And also remember that even though this treatment is considered safe, it’s only a quick fix solution and should not be used for extended periods. Black strap molasses and honey are both very good remedies for constipation and for increasing your energy. They are well-known for their “laxative effect”, due in part to the high levels of magnesium they contain. Use both of these together by taking a tablespoon of black strap molasses and one teaspoon of raw manuka honey before each meal. If you do find these foods too sweet and have trouble eating them straight off the spoon, just add both to a nice warm glass of almond milk. This treatment is also safe to use during pregnancy and for kids and even toddlers too, by the way. So be sure to use it as often as you like to stay regular. It really does work a treat! Having your normal cup of tea or coffee first thing in the morning can work wonders for keeping you regular. Both contain caffeine, which is a natural stimulant for the digestive system and is renowned for getting things moving down below. However, tea and coffee aren’t much use if you’re badly constipated and looking for quick relief. But they are very useful if you’re looking for a simple and easy way to stay regular. Once again, pregnant women can use this remedy but no more than one cup a day is usually recommended. This natural remedy definitely cannot be skipped over! The fact is you must make sure you balance out the good and bad bacteria in your gut if you (and the kids) truly want to be free from constipation forever. Healthy bacteria is essential for proper digestion, which of course includes the elimination of waste from the bowel. Having these “friendly” bacteria growing and thriving in your colon also prevents the harmful organisms (bad bacteria and parasites) that I spoke about earlier from taking up residence and wreaking havoc on the insides of your gut. The best way to get your daily supply of good bacteria is by taking a high quality probiotic supplement, eating natural yogurt and practicing the art of food fermentation. This will ensure your digestive system stays in tip top condition, and best of all, you’ll never have to suffer the awful effects of constipation ever again! So go out and find yourself a quality probiotic supplement and start culturing your own foods (sauerkraut, kefir, yogurt, etc). For everything you need to know about food fermentation and how simple it is to do, be sure to take a look at this informative website… CulturesForHealth. This one isn’t rocket science. If water softens stools then it makes sense that drinking lots of water should help to relieve constipation? And it certainly does this, and does it very effectively. Water is also important for proper digestion and assimilation of your food so make sure you drink lots and lots! You should be aiming to drink at least a gallon of water every day. Yes this seems like a lot, but you’ll feel so much better for it and you'll also be as regular as clockwork! Exercise has been proven to help prevent and treat constipation. It not only induces healthy circulation throughout the body, it also stimulates intestinal function, which includes digestion and elimination of waste. And it doesn’t seem to matter what form of exercise you do either. So just make sure you get huffy and puffy and a movin and a groovin for at least 30 minutes a day! Simply avoid all foods that are man-made (or have been excessively tampered with by man) and only eat foods that have been provided by nature! Plenty of fresh fruit and veggies, along with herbs, nuts and grains are definitely the way to go. These foods are packed with fiber and essential nutrients, which of course are crucial for proper digestion, assimilation and elimination. Prunes: Prunes are extremely high in fiber and guaranteed to keep you regular. Eat fresh prunes daily or drink the juice. Plumbs, pears, apricots, grapes, figs and apples: Also exceptionally high in fiber. These fruits are considered the standard “colon cleansers” and natural constipation cures. Flax seeds: Flax seeds and/or flaxseed oil is a terrific remedy for constipation. It gently cleans and soothes the walls of the intestines and bowel to soften stools and promote regular bowel movements. Cabbage, spinach, beans and broccoli: These veggies and legumes are also excellent high fiber foods that should be eaten as much as possible to stay regular. Apple cider vinegar: Extremely good for digestion. Some people report that ACV helps with their constipation while others say it doesn’t do much. Regardless of this, apple cider vinegar is considered an important health tonic and life extension elixir. Bananas and rhubarb: Two more home remedies for constipation that work very well. Just make sure the bananas are overripe bananas and not green. Green bananas can have the opposite effect and will actually make you more constipated. Psyllium: Another terrific treatment for constipation that helps to soften up stools quite quickly. What’s great about psyllium too is it’s an adaptogenic fiber, so it automatically softens stools if they’re too hard and it hardens up stools if they become too soft. Nice! Fish oil or cod liver oil: Omega-3’s from fish oil and cod liver oil are vital for digestion and assimilation and promoting regular bowel movements. Raisins: Raisins are naturally high in digestible fiber. Be sure to eat a handful daily after a meal. Wheat or barley grass: One of highest known sources of plant fiber. Excellent for cleaning and soothing the walls of the bowel and softening stools. Wheat and barley grass also promote healthy digestion and assimilation of food and nutrients by maintaining the health of the entire digestive tract. So hopefully these recommendations help to treat and relieve your (or your child's) constipation in a hurry. Good luck and all the best!